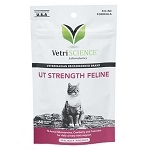 Home > Health Issues > Kidney, Liver and Pancreas > Kidney Support > VetriScience Renal Essentials Chews for Cats - 120 ct.
Renal Essentials Chews for Cats by Vetri-Science helps cats with kidney disease by improving renal blood flow and strengthening the immune response to foreign material in the urinary tract and kidneys. 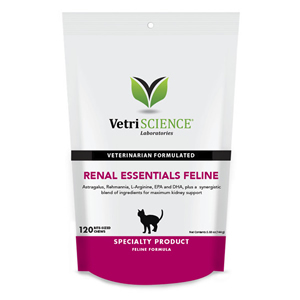 Vetri-Science Renal Essentials Feline Chews helps support cats with kidney disease by improving renal blood flow and strengthening the immune response to foreign substances in the urinary tract. Balance urine pH and mineral levels. Normalize circulation and improve renal blood flow. Strengthen the immune response to foreign material in the urinary tract and kidneys. Cats with stressed or poorly functioning kidneys should be under the supervised care of a veterinarian. Ask your vet if Renal Essentials is appropriate for your cat. I have been giving these to my 21 yr. old cat for about a year and a half, who was diagnosed 3 years ago with kidney disease. She still eats them readily twice a day (she is normally very finicky and loses interest easily of any treat-like item). They are very easy for my ole girl to chew, as well. I started her on them when another natural liquid kidney supplement was discontinued. I was desperate to find something natural that would keep, what is left of her kidneys, functioning as best as possible. I truly believe, along with her low phosphorus food diet, they keep her renal system regulated, as advertised. No one can ever believe it, when I reveal her age, as she still exhibits a high energy level and, so far, no straining or accidents outside the litter box. Thank you Vetri-Science for a great natural product that works!! My cat wouldn't eat it and neither would the other 3. You need to work on this recipe. Astragalus Root is an adaptogen that supports immune function and kidney circulation. Rehmannia is a Chinese herb traditionally used as a blood tonic and to support urine flow. It is said to be the "kidney's own food." It is an adaptogen that supports kidney circulation as well as kidney and liver function. Nettle supports the immune system, circulation, detoxification functions and balanced fluid retention. Cordyceps is an adaptogen and antioxidant. It supports immune system function, energy production, removal of toxins and kidney function. Lecithin may help protect the kidneys from fatty build up. L-Arginine is an amino acid that supports kidney function and circulation. DMG, EPA and DHA support immune function, balance eicosanoid production and blood flow to the kidneys. Potassium is important for mineral balance and water absorption. Vitamin B1 is an antioxidant that supports efficient kidney circulation and the metabolism of fats, carbohydrates and proteins for proper energy production. Vitamin B2 is found in the largest concentration in the liver, kidney and heart. It is an antioxidant that supports metabolic activity for optimal energy production and the removal of unwanted materials from the kidneys. The B vitamins together may help reduce oxalate problems in the kidney and decrease fluid retention. B vitamins are water-soluble and are not properly recycled in times of kidney stress or dysfunction and supplementation may be required. Choline and Inositol are phospholipds that support reduced fluid retention. Folic Acid, DMG, Vitamin B2, Vitamin B12 and Vitamin B6 help to support circulation, methylation and sulfuration pathways. barley flour, brewers yeast, chicken liver flavor, citric acid, fish oil concentrate, glycerin, mixed tocopherols, oat flour, oat meal, propionic acid, proprietary blend (maltodextrin, sodium alginate, calcium sulfate), rice flour, rosemary extract, rye flour, silicon dioxide, soy lecithin, starch, and vegetable oil. Daily amount may be dvided between AM & PM.